The Withlacoochee Gulf Preserve covers 413 acres amidst the wetlands just north of the mouth of the Withlacoochee River in Levy County. 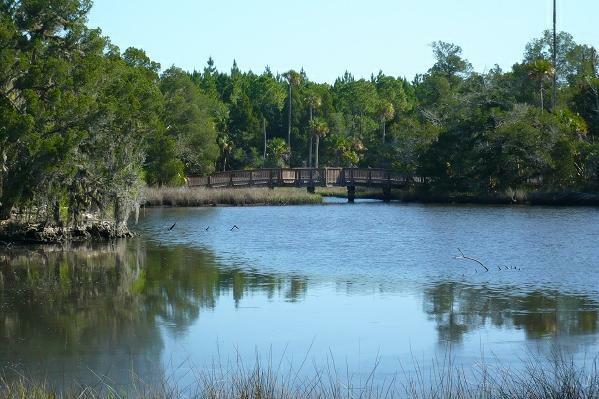 The Preserve is wholly owned by the town of Yankeetown - purchased with a grant from the Florida Community Trust. A variety of recreational improvements have been made with help from various grants ... and constructed with community help. A 4500 square foot educational resource center and nature museum has recently been renevated on the property. The center includes educational displays and meeting rooms. A 30 foot tall observation tower provides a panoramic view of the Preserve and the surrounding wetlands. The Preserve includes a network of three marked hiking trails, with boardwalks and information kiosks. Each trail is about a half mile in length, and offer great views of the salt marsh. Trail maintenance is a joint effort of the Town of Yankeetown, students at the Yankeetown school, and the "Friends of the Withlacoochee Gulf Preserve", a non-profit group. At the west end of the "Yellow Trail" is a pier and a kayak launch. However, the portage of about a half mile from the parking area is not an attractive feature for kayakers. Restroom facilities are available at the education center and at two additional self-composting toilets along the trails.